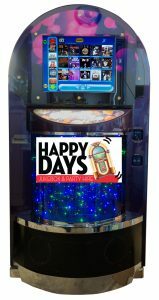 Music tracks range from the 1950s through to the top 40 charts ensuring there will be something for everyone, making it the best Jukebox karaoke machine hire Canberra has to offer. 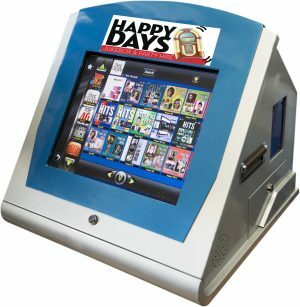 Each and every Jukebox comes with 2 microphones and over 5000 music videos and hundreds of karaoke tracks. All our Jukeboxes include delivery and pick up! 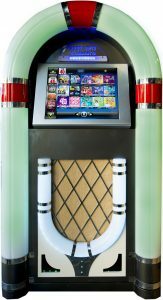 The Star Jukebox features a large touch screen and themed artwork to attract attention. Supplied with 2x floor mounted speakers and microphone, this jukebox rocks the room. Perfect for Karaoke! The Compact Jukebox has all the features of our full size boxes in a compact case. We believe this jukebox puts out the best sound and can conveniently fit in a normal sized car for easy transport. Ideal for out of town events. Kick your party up to the next level by adding these lights to your Jukebox hire. They come with everything you need to create an amazing party atmosphere. 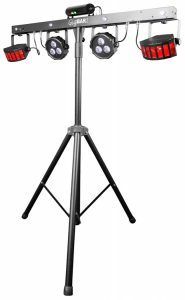 4-in-1 Light that includes a pair of LED derby lights, LED pars, a laser and strobe effect all mounted on one bar.